(Nanowerk Spotlight) Gears, bearings, and liquid lubricants can reduce friction in the macroscopic world, but the origins of friction for small devices such as micro- or nano-electromechanical systems (NEMS) require other solutions. Despite the unprecedented accuracy by which these devices are nowadays designed and fabricated, their enormous surface-volume ratio leads to severe friction and wear issues, which dramatically reduce their applicability and lifetime. Traditional liquid lubricants become too viscous when confined in layers of molecular thickness. This situation has led to a number of proposals for ways to reduce friction on the nanoscale, such as superlubricity and thermolubricity. Researchers in Switzerland now describe a resonance-induced superlubricity, which also occurs in many natural phenomena from biological systems to the motion of tectonic plates. This new method provides an efficient way to switch friction on and off at the atomic scale and, as a simple way of preventing mechanical damage without chemical contamination, could be of enormous importance for the development of NEMS. Friction is the force that opposes the relative motion or tendency of such motion of two surfaces in contact. Historically, Leonardo da Vinci (1452-1519) was the first to enunciate two laws of friction. According to da Vinci, the frictional resistance was the same for two different objects of the same weight but making contacts over different widths and lengths. He also observed that the force needed to overcome friction is doubled when the weight is doubled. Similar observations were made by Charles-Augustin de Coulomb (1736-1806). The first reliable test on frictional wear was carried out by Charles Hatchett (1760- 1820) using a simple reciprocating machine to evaluate wear on gold coins. He found that compared to self-mated coins, coins with grits between them wore at a faster rate. The development of this branch of science, today called "tribology" is the science and technology of friction, lubrication, and wear, derived from the Greek tribo meaning "I rub". The new field of nanotribology extends the study of friction and wear processes on to nanometer scale. A group of Swiss researchers now proposes a way to reduce friction on sliding nanocontacts down to 'negligible' values (piconewtons or below). 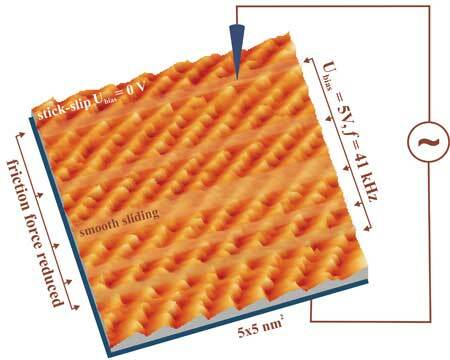 "The idea is to excite the system formed by a sharp tip sliding on a flat surface at its resonance, which can be simply done by applying an AC voltage between the tip and the support of the sample (supposed to be insulating or poorly conductive)" Enrico Gnecco from the UHV force microscopy group at the University of Basel in Switzerland explains to Nanowerk. "Our experiment clearly shows a straightforward way to remove stiction and friction problems arising when nanocontacts slide past each other" adds Gnecco's colleague Anisoara Socoliuc. " Our results indicate that the problem of stiction in nano- and microdevices may be overcome. Parts in physical contact within NEMS are usually small enough to constitute single-asperity contacts, and their structure favors the development of distinct normal resonances. In macroscopic bodies, though, the wide distribution of contact resonances makes our technique difficult to apply." Socoliuc is first author of a recent paper in Science describing these findings ("Atomic-Scale Control of Friction by Actuation of Nanometer-Sized Contacts"). Socoliuc describes the group's work: "For measuring tiny friction forces we employed an extremely sensitive instrument called Friction Force Microscope, where a tip moved over the surface. On a microscopic scale, the tip does not slide smoothly over the surface but jumps from atom to atom. With each jump energy is suddenly released. If these jumps would be avoided frictionless sliding from atom to atom is possible. To reach this an AC voltage has been applied between a sharp silicon tip and a counterelectrode sustaining a crystal surface, while tip and surface slide past each other in ultra-high vacuum. If the frequency of the applied voltage matches a mechanical resonance of the sliding system, friction is dramatically reduced, and practically no energy dissipation is observed in the contact area. This result was simply interpreted assuming that the tip-surface interaction potential oscillates with the frequency of the excitation signal, which periodically leads to "superlubric" effects without breaking the contact between tip and surface." Compared to other techniques recently introduced to achieve reduced friction, the Swiss group's method is not restricted to extremely tiny loads or well-defined crystal surfaces and therefore should find better application in practical situations. Also, the method allows fast switching between a "superlubric" and a "normal" regime, where friction and dissipation are present. The group in Basel is already working on new paper with more details about their theoretical work. Furthermore, they plan to investigate different materials, including metal surfaces, to excite the oscillations with alternative methods, and to exploit "dynamic superlubricity" as an imaging technique. Extensions of their experiment to different environments (ambient atmosphere, liquids) are also under consideration. The theoretical model will be refined to include, for instance, the effect of the finite temperature and sliding velocity. There are still a number of technical challenges to overcome says Gnecco. "First, the design of nanodevices has to be revisited to introduce the AC excitation. Second, we could face complex resonance spectra in presence of several asperities, different environmental conditions, etc. However, none of these issues should be too critical in my opinion."